There’s no company more adept at re-releasing already available product and making it seem fresh than Warner Bros. The four blu-rays included in “The Best of Bogart Collection” are literally just the four previously-available releases in a new case (and nowhere near as extensive career-wise as the DVD-only box set released for the legend a few years ago). They’re even stacked two on top of each other on each side. However, if you don’t own maybe 3, definitely if you don’t own all 4, of these great movies, this is now the best way to do so. And the set includes some neat collectibles at the same time. Pick your favorite. “Casablanca” and “The Maltese Falcon” are two of the best movies of all time while one has to be pretty hateful to come down on the many joys of “The African Queen” and “The Treasure of Sierra Madre”. The transfers are solid (although “Treasure” looks grittier than I remembered it being stand-alone) and the collection includes a remarkable array of special features when taken as a whole. There’s a reason we still watch Humphrey Bogart movies and likely will for decades to come. “The Humphrey Bogart Collection” proves why. o Warner Night at the Movies 1948 Short Subjects Gallery: Leonard Maltin Introduction, Newsreel, 2 Classic Cartoons, Comedy Short, Theatrical Trailers. 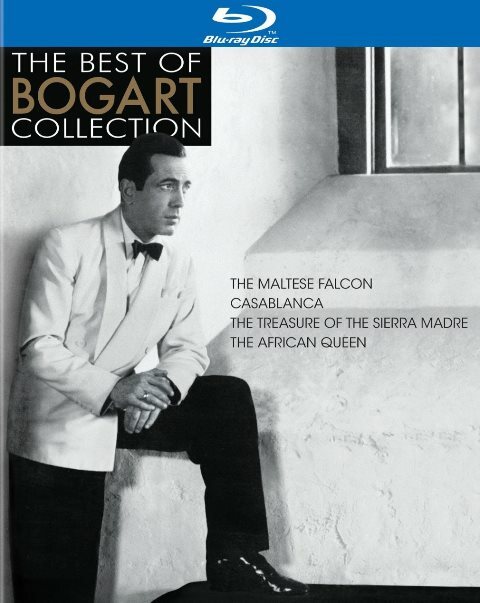 “The Best of Bogart Collection” was released on March 25, 2014.